At the time, 1 in 5 Americans was poor. Today, things are better, but tens of millions of Americans are still living at or below the poverty level. That raises the question: Did the war on poverty fail? In the coming year, NPR will explore this question and others about the impact and extent of poverty in the U.S., and what can be done to reduce it. 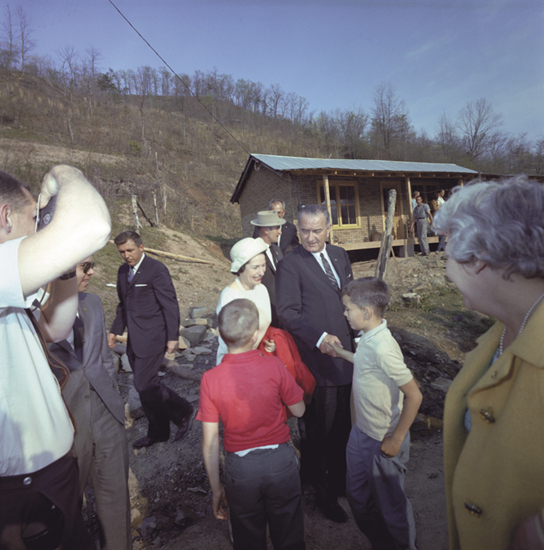 People in the isolated hills of Martin County, Ky., rarely saw outsiders, let alone a president. So when President Lyndon Johnson visited in 1964 to generate support for his proposed war on poverty, it was a big deal. Lee Mueller, a young newspaper reporter at the time, recalls the crowds in downtown Inez, Ky., the county seat, waiting for the presidential party to arrive at an abandoned miniature golf course. “It was just like a hayfield full of long grass. It looked like helicopters landing in Vietnam or something when they came over the ridge,” he says. Mueller says the locals didn’t know their role in this new, domestic war. For the White House, though, coming to Martin County gave poverty a face — and a name. At the time, the poverty rate in this coal-mining area was more than 60 percent. Johnson visited the Fletchers on the porch of their home — a small wooden structure with fake brick siding. Photographers took what would become one of the iconic images of the war on poverty: the president crouched down, chatting with Tom Fletcher about the lack of jobs. Fast-forward 50 years. The Fletcher cabin still stands along a windy road about 5 miles outside town. It now has wood siding and is painted orange. There’s a metal fence with a “no trespassing” sign to keep out strangers. There are lots of small houses and trailers along this road, but also some new, bigger homes that could be found in any American suburb. Today, the roads here are well-paved. People say the schools and hospitals are much better than they used to be. Still, Martin County remains one of the poorest counties in the country. Its poverty rate is 35 percent, more than twice the national average. Unemployment remains high. Only 9 percent of the adults have a college degree. Read More Kentucky County That Gave War On Poverty A Face Still Struggles : NPR. This entry was posted in News from the Soul Brother and tagged 50th anniversary of war on poverty, Great Society, Kentucky, Lyndon B. Johnson, Martin County, poverty, United States. Bookmark the permalink.